After last year’s successful tour with The Trials of Oscar Wilde, European Arts have returned with another theatrical adventure based on the life and work of the much-loved writer, this time offering an adaptation of The Picture of Dorian Gray, Wilde’s only novel, which celebrates its 125th anniversary this month. 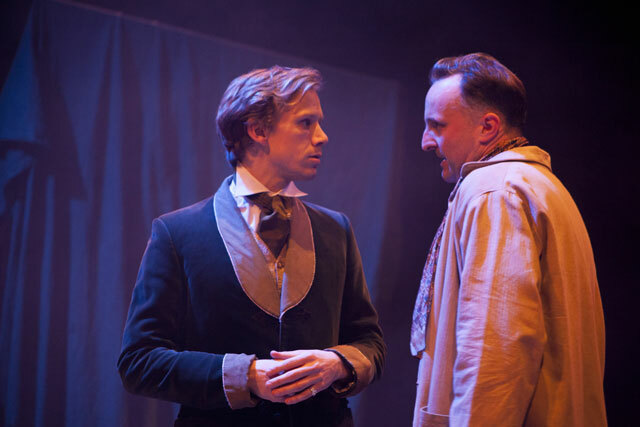 The Picture of Dorian Gray ends its current run this week at the St James Theatre Studio. The show achieves a remarkable feat of telling the whole story of the novel, teasing out plenty of nuance and detail. This is achieved with a small cast of four, and clever set and lighting design (Dora Schweitzer and Duncan Hands) that allows for rapid transitions between locations. Guy Warren-Thomas and Rupert Mason. Credit: Evolutions Photo. Guy Warren-Thomas makes for a compelling Dorian Gray, playing especially well the transition from Dorian as an air-headed but pretty young fop at the start of the story to the monster he later becomes. 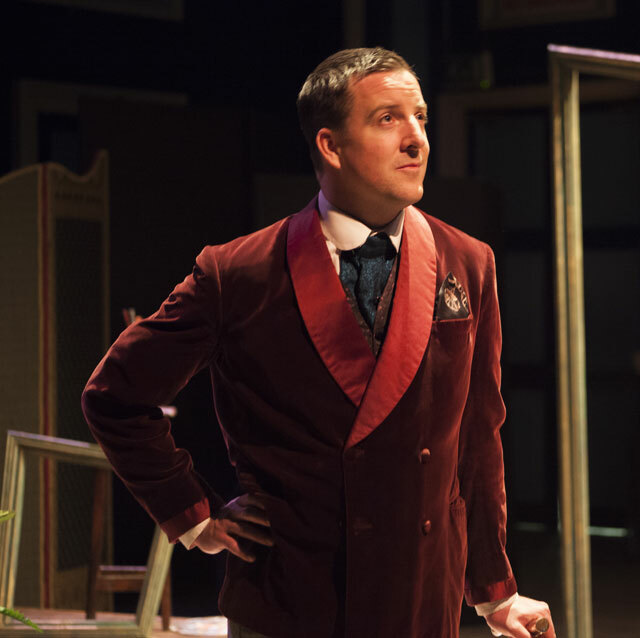 It’s Gwynfor Jones who gets to enjoy the best of Wilde’s bons mots as the witty Lord Henry Wotton, and he delivers them with relish, his slyly seductive eyes leaving no ambiguity (quite rightly) as to his feelings about Dorian. Rupert Mason, returning to the company from The Trials of Oscar Wilde, creates a rather angst-ridden and dour Basil Hallward, but he shines more in a variety of other parts, notably as the noble and vengeful James Vane and as the comically hopeless actor-manager Mr Isaacs. Both Mason and Jones are hilarious as Monty Pythonesque old women; whilst the more feminine female parts are taken by Helen Keeley, who is especially sympathetic as the ill-fated Sybil Vane. Helen Keeley. Credit: Evolutions Photo. There is a feeling that perhaps it would have been better for the script to have been less reverential of the source material and used fewer parts, morphing several supporting characters into one. Gwynfor Jones makes a strong impression as Henry Wotton in the first act, but that character is mostly sidelined after the break and much-missed, and it’s a little distracting when he appears as a butler and various other of Dorian’s friends. Gwynfor Jones. Credit: Evolutions Photo. That reservation aside, The Picture of Dorian Gray is a fast-paced production, slickly directed by Peter Craze, that captures the spirit of the book and its author, conveying the idea of art as autobiography, and challenging our tendency to see purity in beauty. 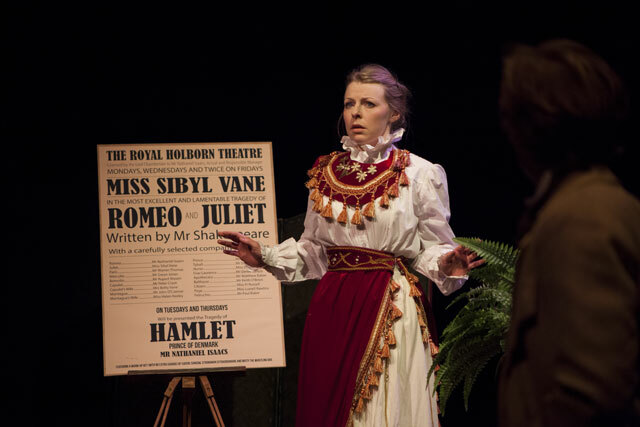 It goes for the melodrama and the Grand Guignol of the original story, and it’s refreshing to see a genuine slice of Victorian Gothic on the stage. Witty and darkly humorous, this The Picture of Dorian Gray is good, authentic fun.